The ankle continues to slowly improve. I’m looking now for opportunities to work the ankle a little, since it seems to help. 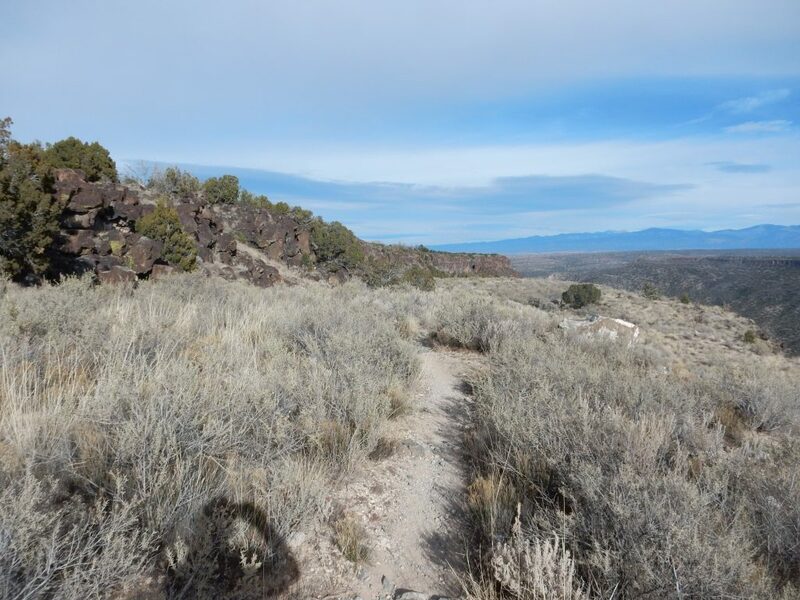 So yesterday I put on the hiking boots and hiked part of the White Rock Canyon Rim Trail. This is a fairly well-maintained trail, it has good cell phone coverage, and it’s pretty busy on weekends, so it’s not unreasonable to hike by myself. I started at the trail head at the end of Kimberly in White Rock. 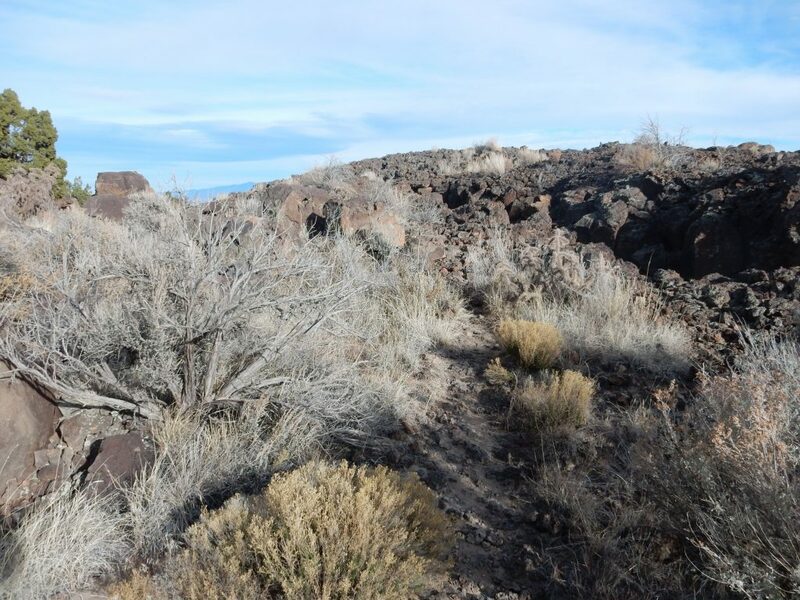 As you can see in the Google map, there is no one Rim Trail; it has branches and strands all over the public land around the eastern perimeter of White Rock. Most of these are probably “social trails”, which people create by repeatedly taking the same short cut through an area. 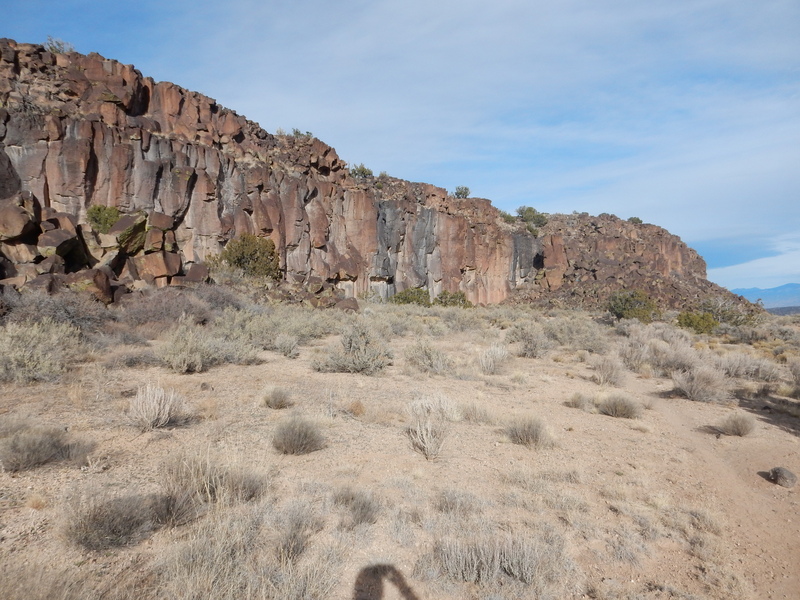 I took what looked like the main trail east, to where it splits at the hinge of one of the most spectacular Toreva blocks in White Rock Canyon. 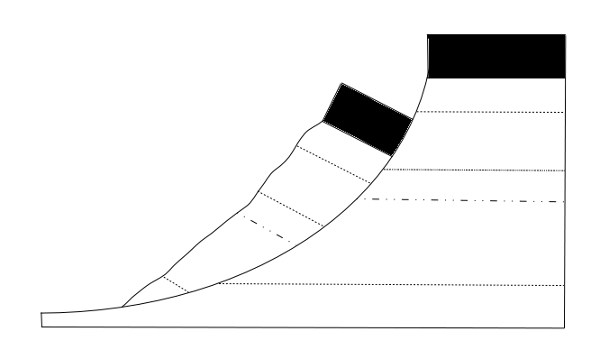 Since the detachment surface (where the block comes lose and slides) is usually slightly curved, the block is usually rotated towards the remaining cliff it has left behind. In White Rock Canyon, both the canyon rim and the Toreva blocks are capped with resistant beds of Cerros del Rio basalt, with much softer beds of Santa Fe Group sediments beneath. 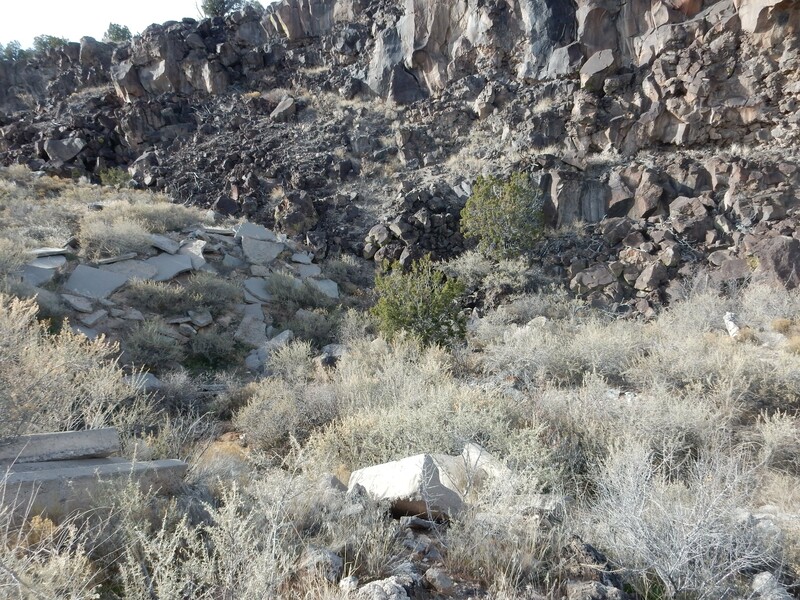 Toreva is the location in Arizona where such blocks were first characterized by geologists. However, White Rock Canyon has many superb examples. Cerros del Rio Formation: This is composed of basalt and basaltic andesite lava flows underlying most of White Rock and the Cerros del Rio Plateau across White Rock Canyon. There are occasional cinder cones, particularly on the plateau, formed late in the eruption. The eruptions took place from about 4 to about 1.4 million years ago, peaking a little under 3 million years ago, and were likely caused by rifting along the Rio Grande Rift, the great crack in the Earth’s crust that extends from central Colorado to the El Paso area. Rifting thins the crust, bringing hot mantle rock close to the surface, and opens fissures through which magma generated from the hot mantle can reach the surface. 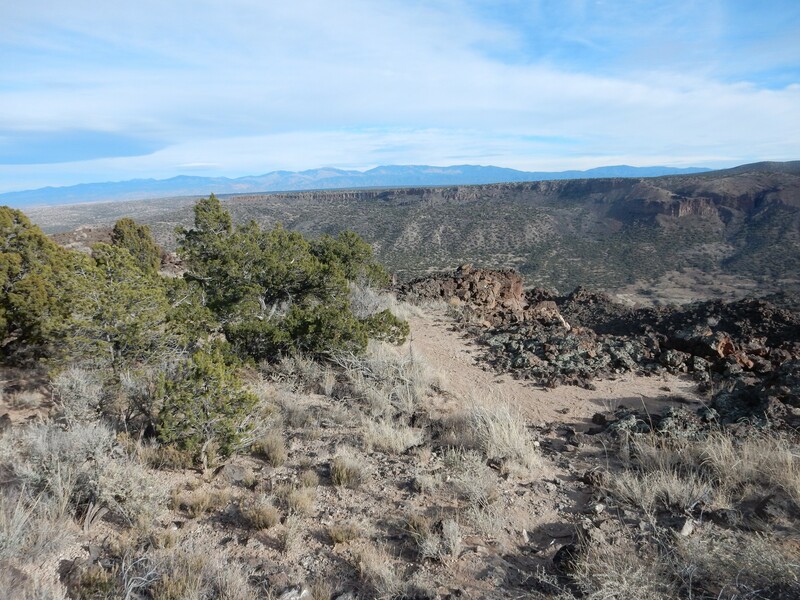 Santa Fe Group: This includes all the rift fill formations of the Rio Grande Rift, formed from sediment washed into in the rift from the nearby mountains as the rift opened. Since the rift first opened around 30 million years ago, these sedimentary beds are all relatively young and are not particularly well cemented into hard rock. This is typical White Rock area terrain in the absence of human disturbance (apart from the trail.) Soils are poorly developed in the arid climate, with a great deal of lime in the soil, and vegetation is scrub adapted to the dry climate. 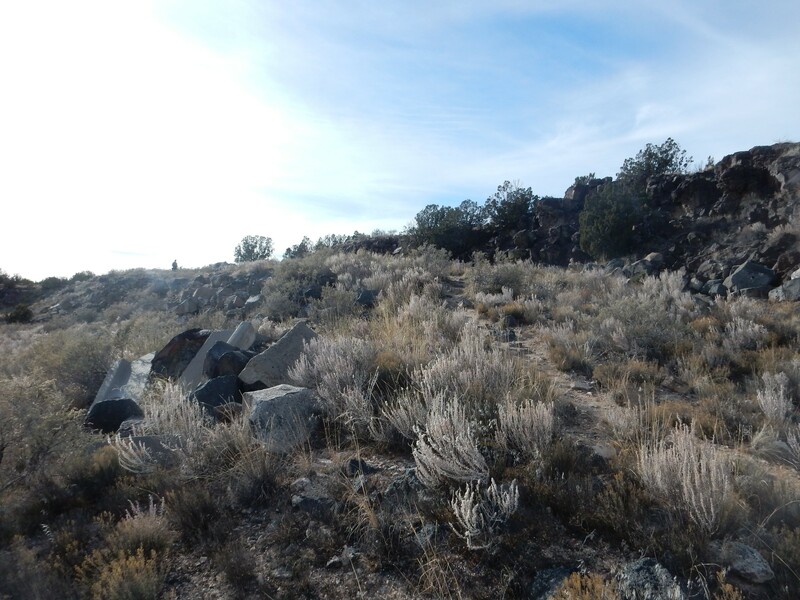 Trees are mostly pinon and juniper, both of which are well suited to semiarid conditions. Note the low escarpment to the left. and the cliff to the right. The white blotch is modern vandalism. The escarpment is quite low at this end of the block. Further down the trail, one can look back and see that the upper end of the block has itself begun to split. 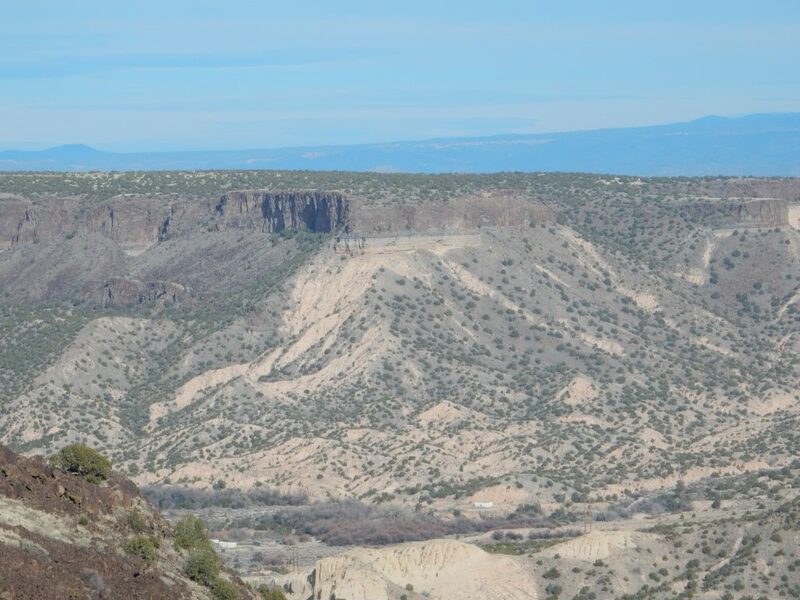 There is an escarpment at right, forming the canyon rim, but another low escarpment at left. As the trail descents, the escarpment forming the canyon rim becomes higher. This exposes some flow boundaries in the canyon rim. One is fairly obvious, about two-thirds of the way down the cliff. However, I can discern a second boundary above this, halfway back to the top of the cliff. And here is what I first took to be a pumice bed. Pumice in this area is worth examining. 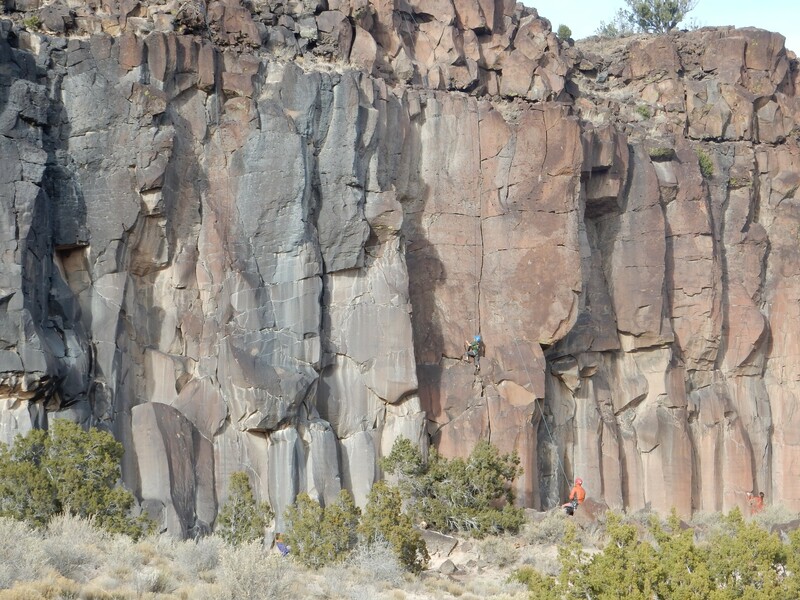 There are substantial pumice beds on the canyon rim further north, and these are a bit of a puzzle. 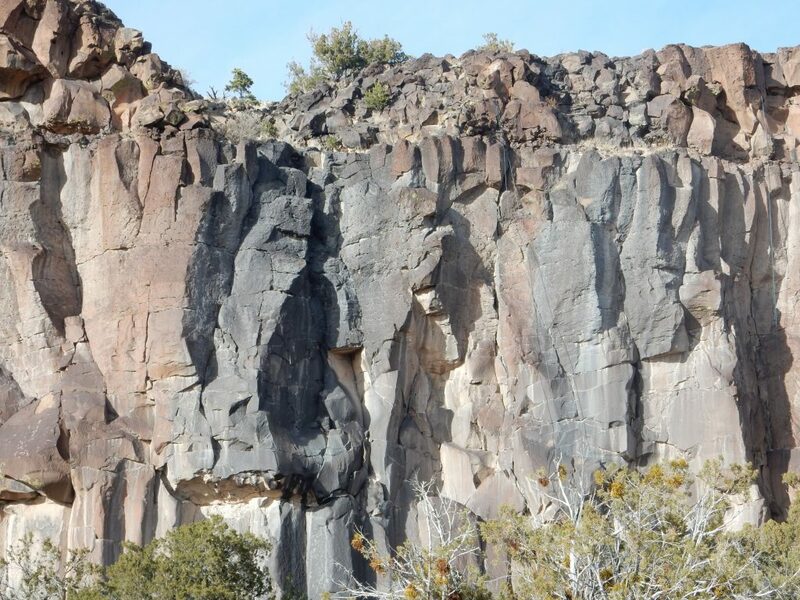 The pumice on the canyon rim is coarse, gleaming white, contains some quartz and feldspar grains, but does not contain biotite mica — which suggests it is Guaje Pumice, from a supervolcano eruption (the Toledo event) 1.62 million years ago. The other prominent pumices of the Pajarito Plateau don’t match: The Tsankawi Pumice is fairly fine grained and tends towards a grayish color, while the El Cajete Pumice is off-white with distinctive biotite crystals. 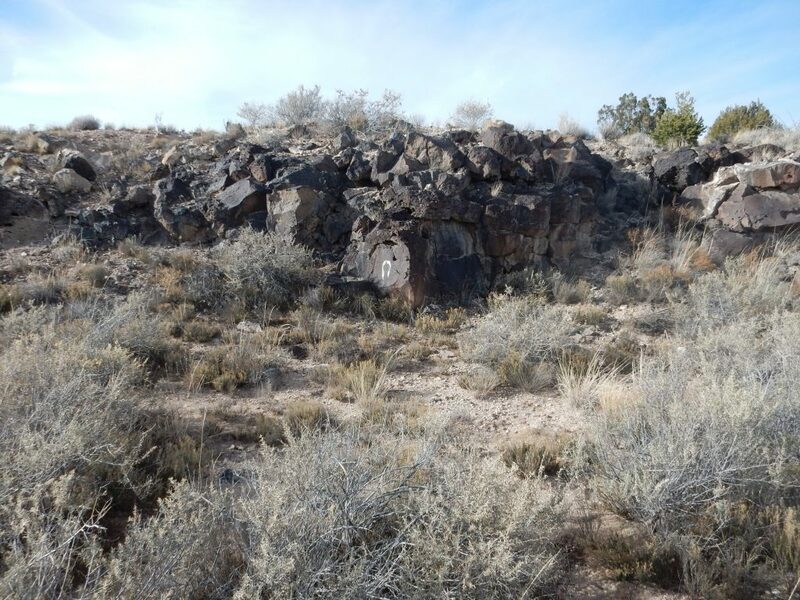 But the Guaje Pumice is relatively old and it is surprising beds of it should have survived this long in this area without a protective top layer of Bandelier Tuff. So I picked up a clast of the stuff here to see what its properties were. It wasn’t pumice at all; it was a chunk of basalt thoroughly coated in caliche, the desert lime coating that is the bane of local gardeners. I looked around the area, and everything here is thoroughly calicified. I found what looked like pumice fragments, but they were so heavily coated with caliche that it was impossible to guess which pumice bed they were from. Further down, the cliffs start to be quite substantial and massive, possibly because this was near an eruptive vent. You can still see the boundary dividing the uppermost flow from the second flow, but the second flow is now very thick and massive. Note the flat ground surface below the cliffs. Sediment has likely accumulated on top of the Toreva block, leveling the surface and obscuring the rotation towards the cliffs. This area is popular for rappelling, since it has easy trail access, and there are some permanent anchors in the rocks above the cliff. I saw and heard a young family at the foot of the cliff; I figured they were probably not there to rappell. I figured wrong. There are a couple of lines already in place to the right. Click to enlarge. Well, all right, then. 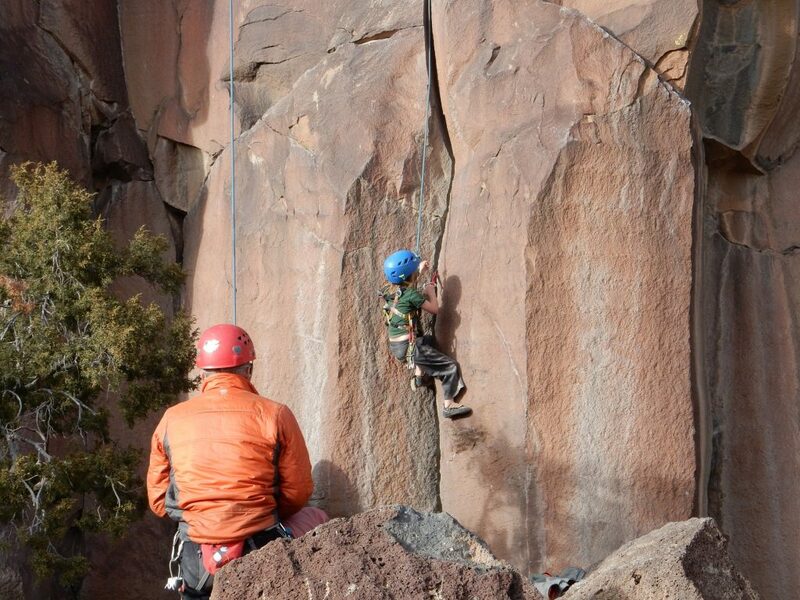 I suppose there’s nothing wrong with having your kids along to watch while you rappell. 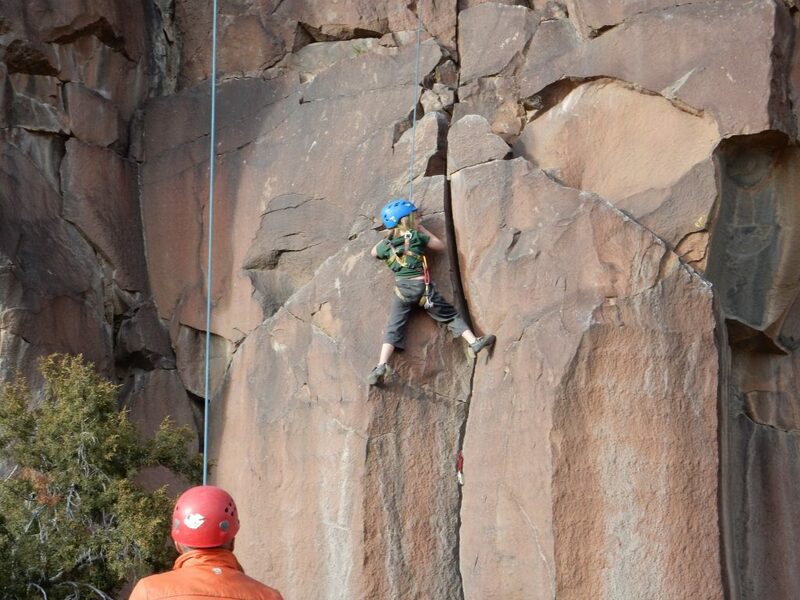 Heck, when I was seven, it would have been way cool to watch my parents spend their Saturday crawling up a cliff like Spiderman. … Also absolutely impossible to picture, but there it is. We will return to these cliffs presently, to have some more assumptions shattered. Meanwhile, the trail continues on down the block. This far north, where the block has slumped the furthest, it is beginning to lose cohesion. We will see more and more irregular debris as we proceed down the trail. The trail disappears here. I pause take a couple of telephoto shots across the canyon to the northeast. 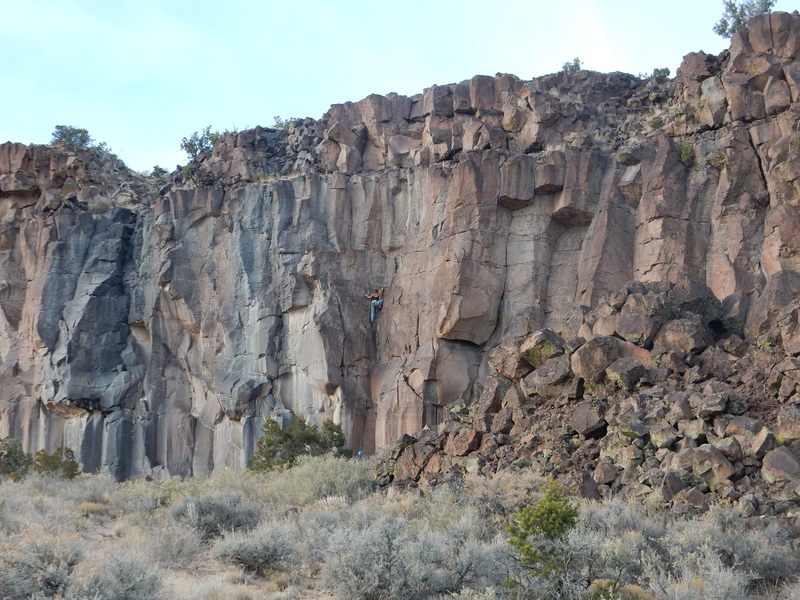 This is a bluff containing a nice sharp contact between the two lithosomes of the Santa Fe Group in this area. As used here, a lithosome is a body of rock with a distinct character within a formation. The formation is likely the Tesuque Formation (though there is a chance it is the very similar Chamita Formation). 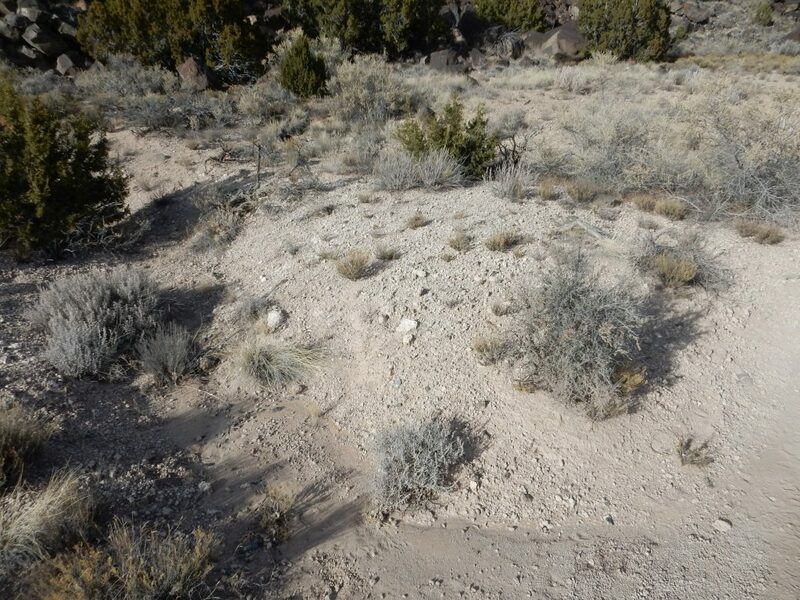 The red beds atop the little bluff are Lithosome A, which contains lots of grains of pink feldspar and little clay and which is thought to be sediments eroded off the granite Sangre de Cristo Mountains to the east. The tan beds beneath are Lithosome B, which lacks the pink feldspar grains, contains a fair amount of clay, and has pebbles in it originating far to the north and northeast. 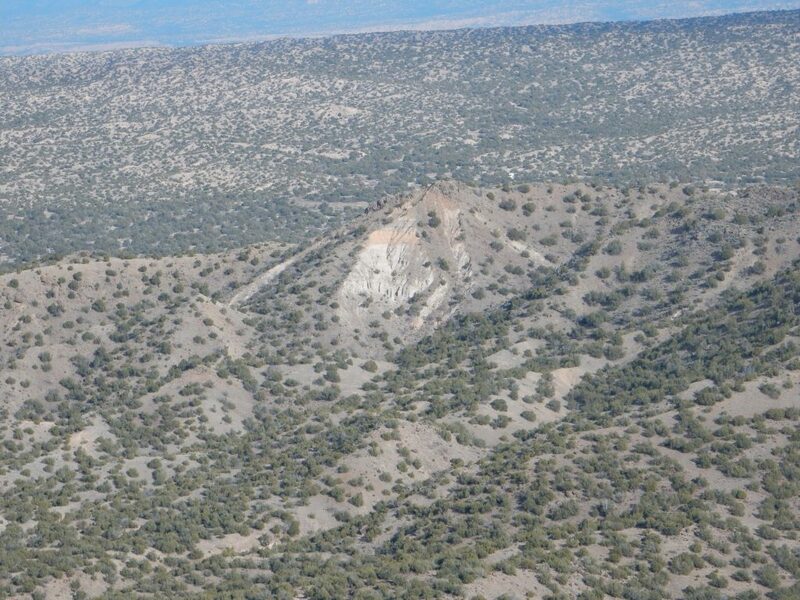 The mesa is Santa Fe Group sediments with a cap of basaltic andesite of the Cerros del Rio Formation. 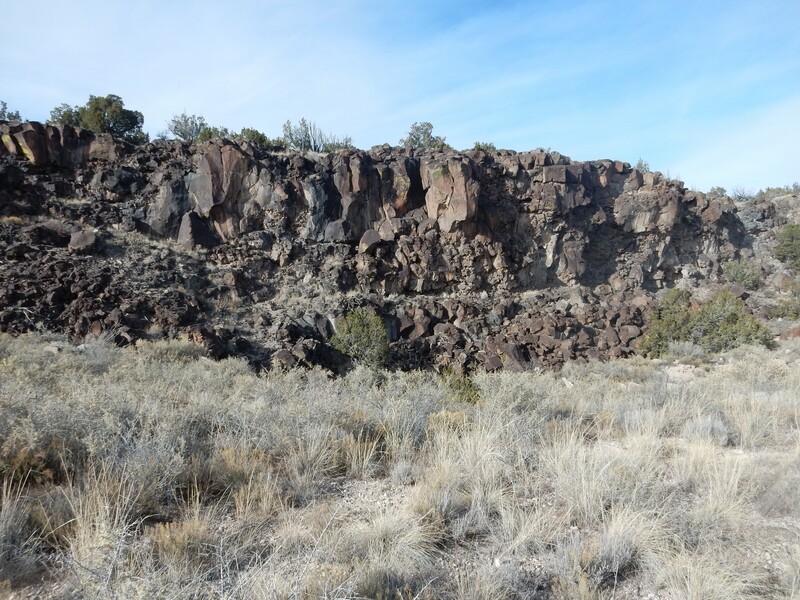 Most of the Santa Fe Group sediments here belong to the Tesuque and Chamita Formations, but there is a thin layer of Ancha Formation near the top, then cinder beds immediately below the lava cap. Notice how very flat the sediment beds are below the lava cap. 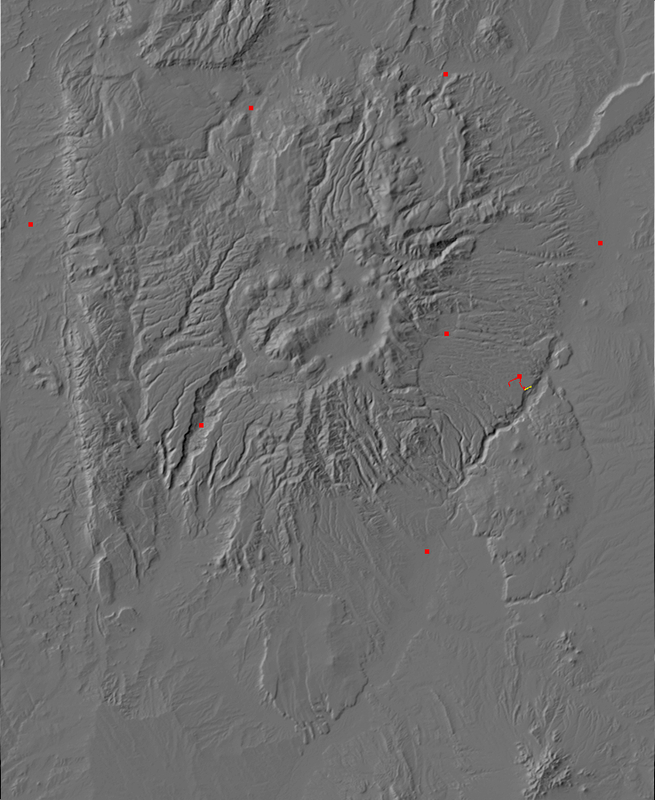 The lava erupted onto a very flat surface, most likely a mature flood plain of the ancestral Rio Grande, or possibly a lake bed. 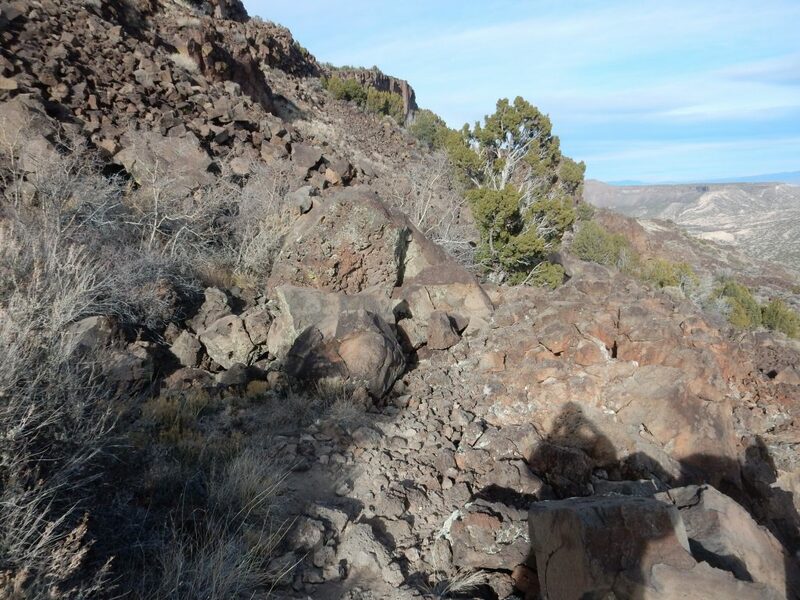 Turns out the trail reappears on the other side of the basalt rubble we just saw. However, it does not go much further before ending at the tip of the Toreva block. I thought: The kids must be having a blast watching their mom do this, and looking forward to the day when they get to. The kid can’t be much more than seven years old. Sure, his parents helped him a bit, but still. This is one of the most encouraging things I’ve seen in years. I worry that a lot of the kids today are being smothered in protection by their parents. (Yes, the epithet “snowflake” has been known to cross my lips, and I’ve been known to make quiet helicopter noises to a friend while witnessing some parents in public.) But this would make my friend David Pimentel proud. And, yeah. If my dad had tried to get me to do this at that age, I’d have flat refused in terror. 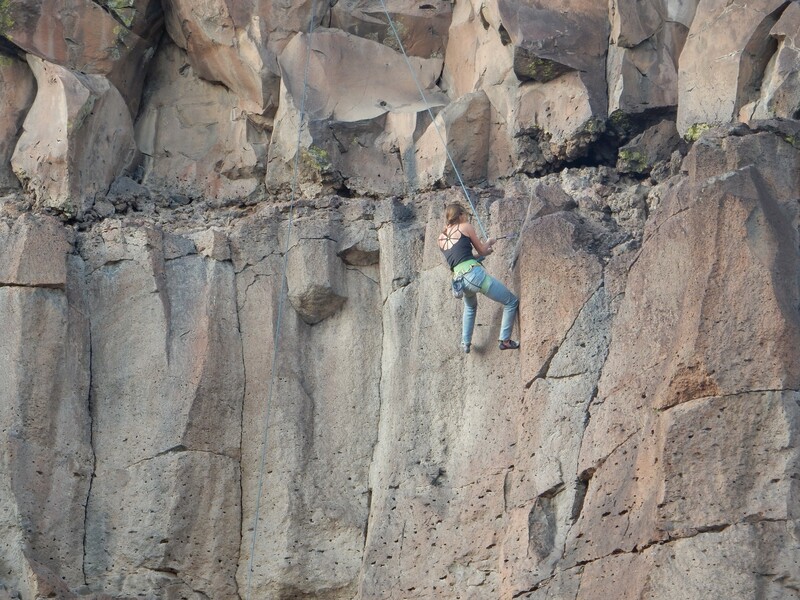 I didn’t even get to the top of that d-mn climbing rope in the school gymnasium until I was almost 11 — a major milestone and the only time I ever saw my tough old P.E. coach nearly cry. Okay, I may be exaggerating that very last bit. Incidentally, I did ask the parents for permission to take these photographs. There was another fellow a little ways down the cliffs, who was doing I am not sure what. He appeared to be hugging the cliff, but it looked like he might have rosin on his hands, suggesting he was a free climber trying to decide if this cliff could be free climbed. (My guess: No.) I hesitated to ask so I don’t know for sure. I hiked back onto the canyon rim, a little ways north on the main trail (to be sure I had my whole exercise quota) and then returned to my car. Really liking the new hiking boots. They still need a little breaking in, but they seem sturdy, they’ve held up well so far to rocky trails, and they do a wonderful job of supporting my ankles. So, what produced the Toreva blocks of White Rock Canyon? The hard cap of lava over softer sediments provided the basic ingredients, but the actual slumping likely occurred during the last glaciation of our current Ice Age, before the warm spell set in in which all human history has taken place. 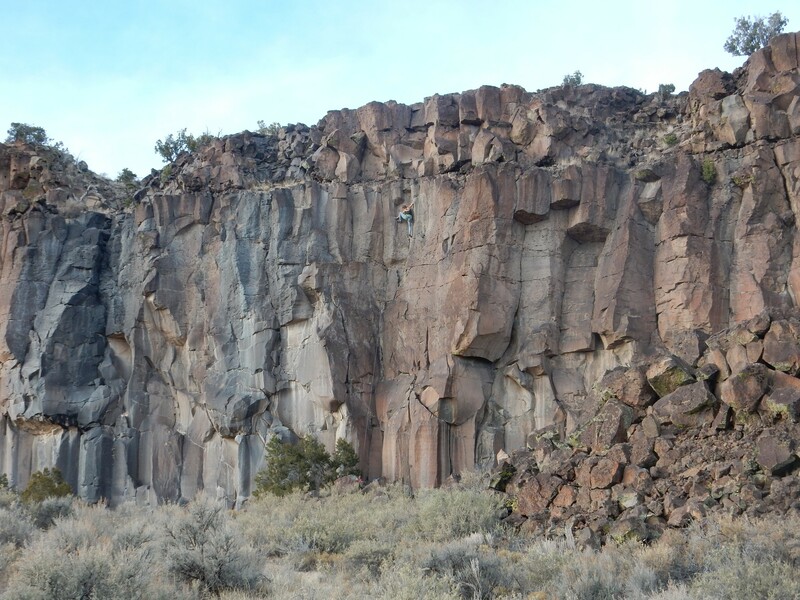 The climate was wetter then and there were likely more and higher springs in the canyon walls here, and wet sediments would have been prone to breaking loose. We know that there are periodic earthquakes (a few tens of thousands of years apart) on the nearby Pajarito Fault, and perhaps these helped trigger some of the slides. Could it happen again? Not very likely in any given year, in our current climate, so I’ll go on envying folks who can afford large homes right on the canyon rim. But probably someday, perhaps when the current interglacial ends and the climate goes back to being cooler and wetter.